TORONTO — For a few moments late Sunday afternoon, Stefanos Tsitsipas showed flashes of the play that earned him four straight upset wins and a berth in the Rogers Cup final. Unlike the other top-10 opponents who fell to the rising Greek star, Rafael Nadal showed why he's the best in the world. Nadal overcame a late service break and fought off a set point before completing a 6-2, 7-6 (4) victory at Aviva Centre. He converted his first match point of the tiebreaker to win his fifth ATP World Tour title of the season. "He never cracks," Tsitsipas said. "He will always grab you like a bulldog and he will always make you suffer on the court." It was Nadal's 33rd career ATP World Tour Masters 1000 crown. He improved to 4-0 in Rogers Cup final appearances. Tsitsipas, who was playing his first career Masters 1000 final, had no real answer for the world No. 1 in front of a near-sellout crowd on a warm, sunny afternoon. Nadal was steady and effective, using punishing groundstrokes to work Tsitsipas around the court. The Greek youngster, who turned 20 on Sunday, appeared flummoxed at times and never really found his rhythm. Tsitsipas finally got a break to tie it at 5-5 and was a point away from forcing a third set before Nadal returned to form. "I'm very happy to have this trophy with me again," Nadal said. "It means a lot. It has been a fantastic week, a very positive one." Nadal, who won their only previous meeting in the Barcelona final earlier this season, earned his 80th career title. It was still an incredible week for Tsitsipas, who will move from 27th to 15th when the new world rankings are released Monday. He beat No. 8 Dominic Thiem, No. 10 Novak Djokovic, No. 3 Alexander Zverev and No. 6 Kevin Anderson before falling to Nadal. "He was normal like all of us and he managed to become this beast, this monster that he is today," Tsitsipas said. "It's true ... that's how you feel when you play against him. "I need to work much more and hopefully I can reach his level one day." Both Nadal and Tsitsipas held at love in their opening service games before the veteran Spaniard went to work. He converted his third break-point opportunity of the game when Tsitsipas volleyed wide. Tsitsipas didn't hide his frustration at the early deficit, pulling out the spare ball from his pocket and launching it out of the stadium. Shots that were working earlier in the week — floating drops from the backcourt or off-speed serves — either hit the net or fed into Nadal's hands. Tsitsipas was left muttering to himself and shaking his head after the first set was completed. The Spaniard didn't let up in the second set as he broke Tsitsipas in the opening game. Nadal's punishing pace and consistency set him up to serve for the match, but he tightened up and it proved costly. Tsitsipas won the first two points of the game and converted his second break-point opportunity to get back on serve. Tsitsipas picked up a mini-break in the tiebreaker, but a couple unforced errors proved to be his undoing. Down 4-5, Tsitsipas found the net to give Nadal two match points. 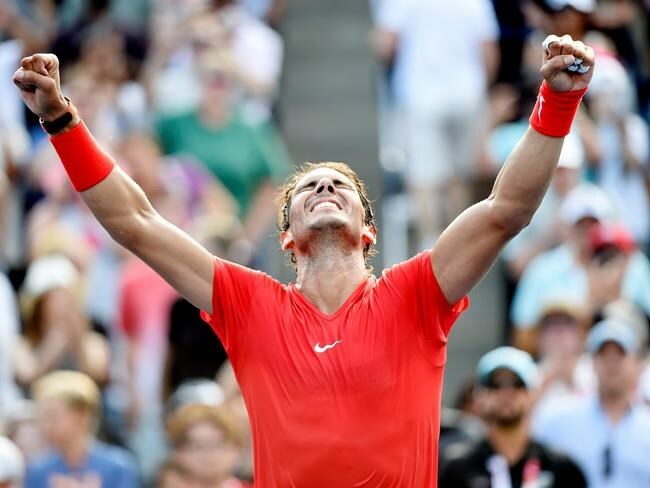 Nadal came through with an inside-out winner for the victory, falling to his knees and shouting to the sky in joy. "At 5-4 I got nervous, I am a completely human person," Nadal said. "I got nervous and I missed it. After that I accepted the situation, just fought back and tried to stay positive. "In the tiebreaker, I played a little bit of a better game." Nadal, 32, earned US$1.02 million with the victory. Tsitsipas, who said he drew inspiration from Canadian Denis Shapovalov's deep run in this event last year, pocketed $500,340. In the doubles final, second-seeded Henri Kontinen of Finland and Australian John Peers defeated Raven Klaasen of South Africa and Michael Venus of New Zealand 6-2, 6-7 (7), 10-6. Kontinen and Peers will split $316,000 for winning their third title of the season. Notes: Nadal is fourth in overall titles in the Open era. Jimmy Connors leads with 109, ahead of Roger Federer (98) and Ivan Lendl (94). ... Rogers Cup tournament director Karl Hale said preliminary discussions are underway to explore the possibility of adding a roof at the venue, adding the "public/private endeavour" would likely cost around $70-80 million. ... Overall attendance for the week was up from last year at 150,597.